Aussie Football stars arrived at pubs dressed as superheroes and gangsters for Mad Monday celebrations! 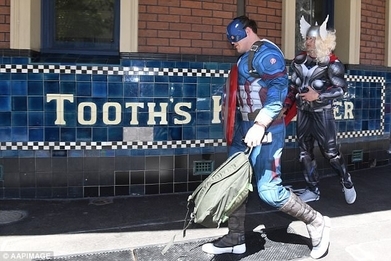 Thor and Captain America have been spotted today in pubs as rugby league stars descended upon bars following the conclusion of the regular season in Sydney! Identical twins and Canterbury-Bankstown Bulldogs stars Josh and Brett Morris arrived as the famous Marvel characters at the Harbour View Hotel in Sydney! Captain James Graham walked into the pub sporting a bleach-blonde wig while others came as movie characters and gang-members. Upon arrival to the Sydney hotel, Josh Morris held a press conference with the media, discussing the club’s cloudy offseason and question marks over the future of the coach and captain of the club. Morris answered serious questions about the state of the team but was seriously constrasted by his ridiculous Thor wig and costume. Get your qualifications transferred today with us here at the Down Under Centre!